Parkway Concert Orchestra, a 50 piece non-profit orchestra, concludes its 74th season with Rossini and Dvorak on Sunday, May 19 at 3 p.m. at Saint Susanna Parish, 262 Needham Street, Dedham. 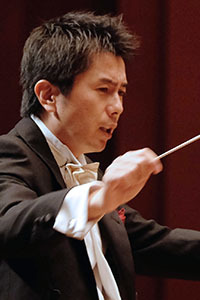 Guest Conductor Yohei Sato will conduct a lively program including Rossini's overture to 'The Thieving Magpie,' Finlandia, music from 'Chicago' and Dvorak's Symphony No. 8. The concert features students of the Dedham Public Schools in Beethoven's Egmont Overture. This concert is sponsored by Dedham Savings and is supported in part by a grant from the Dedham Cultural Council, a local agency which is supported by the Massachusetts Cultural Council, a state agency. Doors will open at 2:30. Donation is $15; $10 for seniors and students; and free for children under 12 years old. For ticket reservations, please call 781-444-5041 or email parkwayconcertorchestra@gmail.com. Mr. Sato debuted as a conductor in 2002 leading the Quincy Symphony Orchestra at their pops concert. He directed Chorus Boston from 2003 to 2009, served as the assistant conductor of the Boston Civic Symphony Orchestra from 2008 to 2009, and has appeared as the conductor of Melrose Symphony Orchestra, The Boston Conservatory Orchestra, Parkway Concert Orchestra, and Cambridge Symphony Orchestra. Since its founding in 2007, Mr. Sato has held the conductor and music director position of Boston Chamber Orchestra (BCO). The following year, Mr. Sato founded Youth & Muse, an international summer music festival providing opportunities and lessons by world-class instructors for young and talented musicians at The Boston Conservatory. Mr. Sato has been invited to perform in world-famous concert halls, such as Boston Symphony Hall, Jordan Hall, the Kennedy Center in Washington D.C., Carnegie Hall in New York City, England, Australia, Canada, Japan, Korea, Taiwan, Albania, Czech Republic and China. Aside from his career as a classical music conductor, Mr. Sato has served as the music director and conductor of Video Game Orchestra, which consists of chamber orchestra, choir, and a rock band, since the beginning of 2009. Mr. Sato holds a bachelor's degree in oboe performance and a master's degree in orchestral conducting from the Boston Conservatory. He has studied conducting with maestro Bruce Hangen.